It’s your time to shine, college girl! 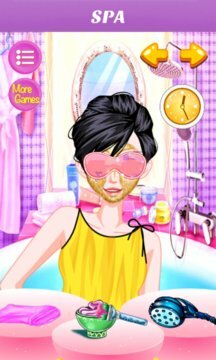 In this amazing app, you can complete your makeover with all new fabulous spa features! Begin your glamorous makeover by taking care of any embarrassing skin problems like zits and Unplucked eyebrows, and then get your relaxation on with soothing facial masks, cucumbers, and even steaming treatments! Make your hair shine with fancy shampoos and blow dry your luscious locks smooth! Every little girl dreams of this day, and now it’s time to get ready for your own special wedding ceremony! Start out with a relaxing day at the spa, cleansing your skin so that you look your absolute best! Wash and brush your hair, get a facial by using the luxurious steamer, and even put cucumbers on your eyes. It’s so relaxing you might fall asleep and miss the wedding! You can’t get married without a head-to-toe beauty makeover too! Makeup is the most important part! This bridal shop has an amazing selection of dazzling eyeshadows, blushes, lipsticks and more-- you’ll look stunning, guaranteed! With so many colors and styles of makeup to choose from, you can be a truly beautiful bride! Now that you're relaxed and pretty, it’s time to put on your dress! Accessorize when you choose from an enormous selection of veils, gloves, necklaces, shoes, bouquets and so much more! Your guests are waiting and you won’t disappoint, with a fabulous selection of dresses and accessories. No wedding is complete without a beautiful outfit to bring it all together. It’s your special day, after all! > Try on many different outfits & accessories while you get ready for the ceremony. > Treat yourself to facial masks, cucumbers for your eyes, and even a steam treatment! > Wash and blow-dry your hair to perfection. > Apply makeup to finish your 5-Star spa treatment! > Photo Fun: Take pictures to save the memories! > My Gallery: In a rush? No problem! Just save your creation in My Gallery and keep working on it when you want to! > 6 Different beautiful models for the wedding, each with their own dress style! > Hundreds of dress up items such as veils, dresses, necklaces, shoes, and wedding flowers for the perfect outfit! > 30 different types of makeup, such as: lipstick, blush, and mascara! > 8 different spa treatments, such as: eye masks & facial mask, for the ultimate wedding’s spa day! Christmas Day, on December 25, is one of the most festive Christian holidays in many countries around the world. children can take a beautiful dress standing in front of a mirror, and then get together with family or friends. People exchang presents, sing Christmas songs or go to clubs to celebrate Christmas Day. Maybe Santa Clausor or Father Christmas will came to the house and give children Bobby as presents. Merry Christmas, everybody! Now are you ready to welcome the new year!